In today's marketplace, businesses need higher productivity, improved technology to edge out competition and be able to streamline their operations. With the constant evolution of technology comes the need for ongoing support and maintenance that's essential for businesses to run efficiently. As a business continues to grow, their need for improved software must be implemented. In many cases, the software is outdated and modifications must take place to meet the new challenges of a business. That said, totally replacing software is not always the answer and can be extremely inconvenient. Modifying your existing application can be a better alternative in many cases. Your business should have a good application support and maintenance team that fits your needs. With the right team, your business will stay on course, concentrate on overall growth, provide customer satisfaction and stay ahead of the competition. Protecting your business operations and customer satisfaction will make your life a great deal easier. We've been in service for 16 years and have been a professional, reliable partner with many companies in many different industries. Some of these industries include; education, oil and gas, banking. We provide all types of ongoing maintenance and support, at different levels, to meet the needs of our customers' software concerns. Our in-house team of professionals have the knowledge and understanding of HIPPA Regulations, VPAT, security protocols and disaster recovery procedures. Working with enterprise level systems has given us extensive experience, enabling us to quickly offer the best solutions possible, for any maintenance and support assignment you need taken care of. When a support request is submitted to us, we will give you an analysis of the problem or disadvantage along with our recommendations to rectify the situation. At the end of each month, you will receive an investigative summary report detailing the support that has been carried out along with the concluded results. Your business does not stop at 5:00 PM and neither do we. Our services are available for emergency support 24/7, ensuring your business is operating perfectly all the time. Our average response time is 30 minutes, your request will be handled in a very timely manner to ensure your peace of mind. The level of involvement varies with each client along with the level of support needed. We can work along side your employees or serve as an extension to your client support staff. We can serve as your outsourcing maintenance support team which will require no participation on your part. We know you need to focus on other business operations and allocate your resources to other important business core requirements. We will provide a complementary system investigation to get a better understanding of the application's features, functions, and complexities. As your maintenance and support partner, we will sit down with you to discuss your goals and vision for the software. We will customize a maintenance plan for a monthly or annual payment option that will fit your needs and budget. Build Your Team With Us Today! Give us a call at 713-783-8886 ext. 112. We will set you up with your own dedicated project manager. We will then schedule an appointment at our office and take it from there! When it comes to maintenance, choosing the right vendor is extremely crucial in order to enjoy the undeniable perks of maintenance. We believe that there are 5 critical elements that must be taken into consideration when selecting a vendor to help you with your customer software maintenance. Custom application maintenance includes but is not limited to bug fixes, system performance maintenance and software enhancement. 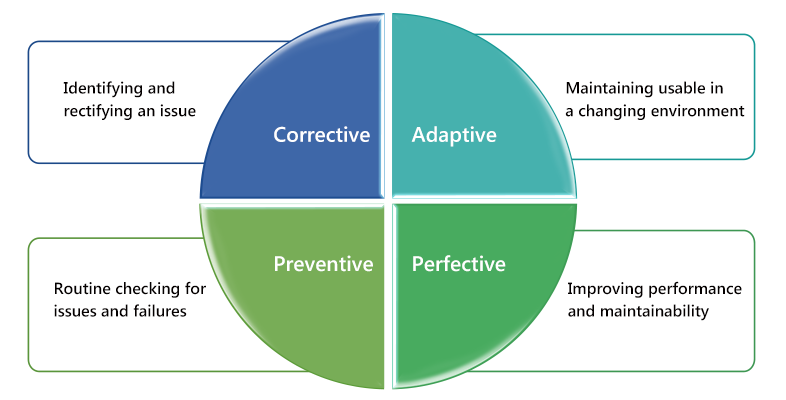 Application maintenance can be categorized into the four areas shown below. Adaptive Maintenance Adaptive maintenance modifies software to keep a software product usable in a changed or changing environment. Corrective Maintenance Corrective maintenance identifies and rectifies an issue with the goal of restoring the software to an operational condition. Perfective Maintenance Perfective maintenance is modification of software to improve performance and maintainability. Preventive Maintenance Preventative maintenance aims to prevent or avoid software failures by routinely checking the software for issues. What comes to your mind when you start thinking about system maintenance? “BUDGET!”, and this is the reason we list this element as #1. Many companies find it a headache to manage the maintenance budget but, actually, it is not hard. Don’t hesitate to consult a professional for a maintenance task plan and have it prioritized. To make it easier for you to proceed, rank the items based on priority. Next, evaluate the impact or each task item to your business. Now you have criteria to consider when setting up your maintenance plan. Please note that one crucial thing to keep in mind is that not all systems require the same level of maintenance, and it is important for you to understand your needs before proceeding to the next step. The maintenance task list should be designed based on your system’s size, traffic to your system, data security level, and data volume. Feel free to ask for fixed quotes from your vendor to allow for easy monitoring. For those with more flexibility in their spending and timeline ask for time and material, and request timesheets on a bi-weekly basis. Your business deserves something better – something professional. Don’t settle for less! Quality here refers to the professional experience and responsibility. Various maintenance tasks need to be planned and done afterhours. We suggest you to hire staff with great expertise in your system’s language, and by language we are not referring to English, French, or German. Staff must be well-versed in languages your system use such as .Net, Java, objective C.
Customer support is the key! Bug reproduction and many other tasks require extreme patience, great communication and listening skills when working with end users. Easy access and prompt response are key when communicating maintenance requests. Here at SunNet, our employees respond to clients’ request within 30 minutes, in general. We are dedicated to offering you the most reliable services – anytime you want! Need urgent help? Emergency support is a must-have to avoid any disastrous situations that might occur unexpectedly. If your application is down during crucial business hours, you want someone that can get your business back up and running in as little downtime as possible. Let us handle all the legwork for you! If your system is complex, it is recommended you use a system to track all maintenance task status. 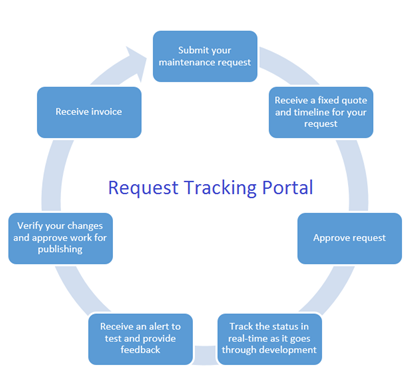 At SunNet, we have developed a real-time tracking portal that allows you to submit, track, review and approve all requests. It is 24/7 which allows you the convenience of logging in any day, any time and finding out the latest status. You’ve learned that maintenance is a critical component in ensuring you’re getting the most of your custom software. But where do you start? What tasks should you consider when speaking with your vendor? We’ve listed the top 14 MUST DO maintenance tasks that you should look to for an optimized system.